Review of Anchor Porter | Beer Apprentice - Craft Beer News, Reviews, Interviews and Info. Today I’m going to review one of my all time favorite beers. The lovely Anchor Porter from the Anchor Brewing Company out of San Francisco, California. First, I’m going to give you the brewers description as taken from their website at anchorbrewing.com. 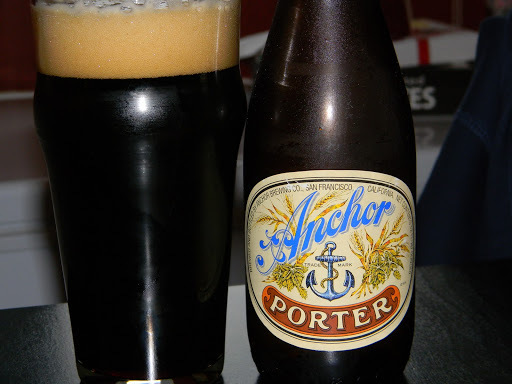 Anchor Porter is a unique dark brew, which was introduced by Anchor in the early 1970’s. Anchor Porter, like all of Anchor Brewing Company’s products, is brewed with only natural ingredients. Specially roasted dark malts are used, along with a top-fermenting yeast. The brew is hopped at a very high rate, and is naturally carbonated to produce an intensely rich flavor and thick creamy head. The rich flavor of Anchor Porter has earned this delicious and unique brew a worldwide reputation for outstanding quality. We use specially roasted malts, a top-fermenting yeast, and only fresh whole hops, which are added liberally. All this combines to produce a rich and intense flavor with subtle notes of chocolate, toffee and coffee. This 12 oz. bottle clocks in at 5.6% ABV. As you can see from the picture the beer poured a full, lush, creamy, cream colored head. The color is almost pitch black. Only the faintest dark red/ruby highlights around the edges. This brew looks outstanding in the glass. The head is really sticking around and it leaves a copious amount of lacing behind after each sip. A rich chocolate and coffee malt comes to the forefront of the nose. The aroma is also evoking a roasted and smokey note that is very delightful. The taste is very similar to the smell by recalling the chocolate and coffee. It’s not overly sweet, but it has just enough sweetness for a teasing. The smokey flavor adds delight by appearing in a delicate way in the end. The mouthfeel is medium to full, chewy and very smooth. Very creamy also. The coating of the tongue and throat is very delightful as the flavor hangs around for a great long while. I really, really like this brew. I have had several Porters over the last few years and this one has to be near the top of ones I have tried thus far. It’s perfect for those late Autumn and Winter days and evenings. It’s easily drinkable and it’s a brew that I will have to visit every year at some point or another. I want to thank Anchor for brewing this tasty beer. Score: 4.5 out of 5.